When I decided to join Luxcon, I started to observe the website and FB account more closely. 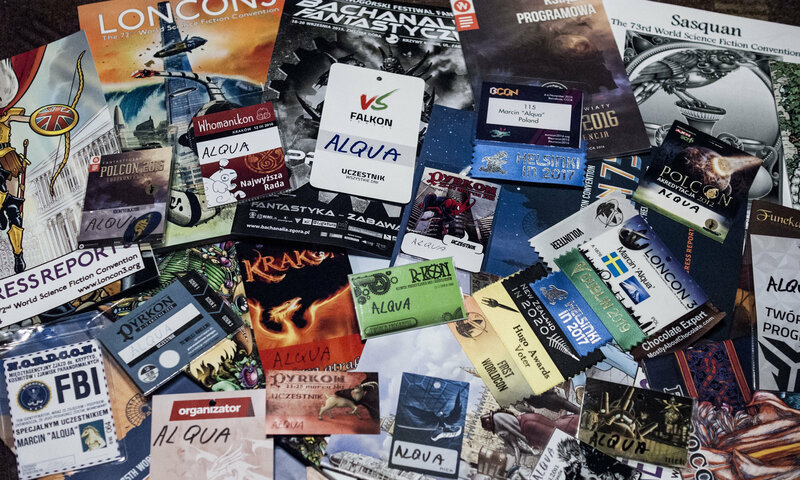 At some point I was a little bit afraid how the convention will look as there was not enough information provided (at least for a person who is planning an international trip to attend). The Guests of Honour were not announced sufficiently in advance and even when convention was really close, the programme was still not published. Still, I had my tickets, my programme item confirmed and my volunteering commitments, so I knew I would be going. Luckily in the end all the information appeared on the website so it seems I was just too impatient. 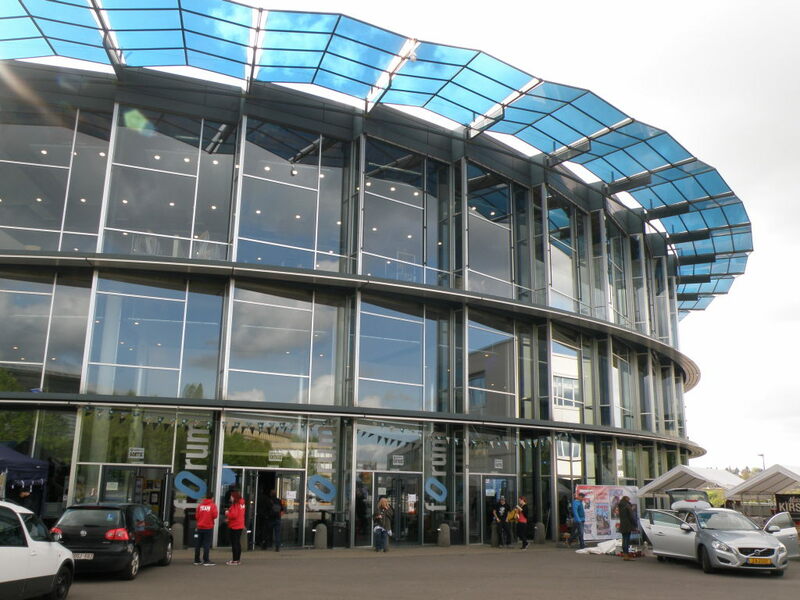 Luxcon’s venue – Forum Geeseknäpchen – is spacious and impressive. I think that there wasn’t enough space for programme rooms, but some programme rooms were there. 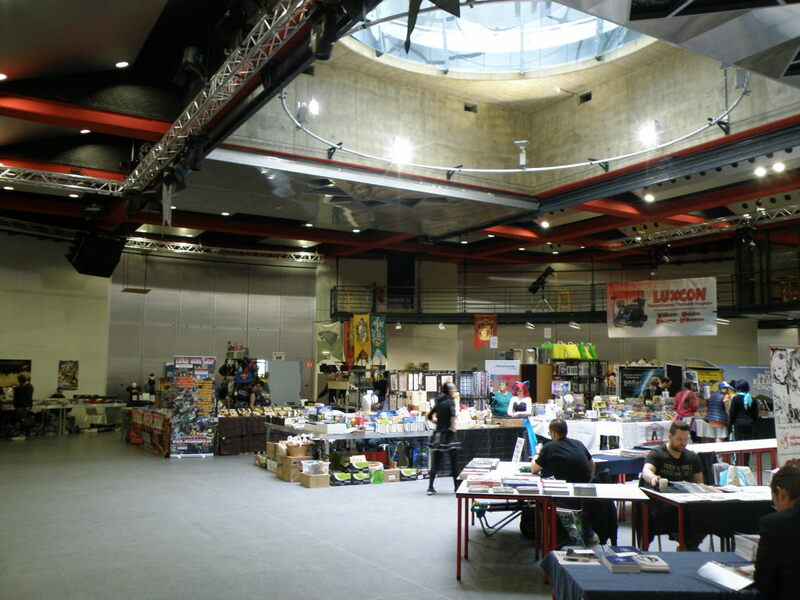 Apart from that the building offered a nice central area for the Dealers Room and a lot of space for gaming (with some „walls” allowing to separate RPG sessions). There was a big empty space in the front of the building, where people could socialize and where the foodtrucks (and one of bars) were located. A large part of corridor on the ground floor was filled by multiple associations presenting their hobbies to all the members. 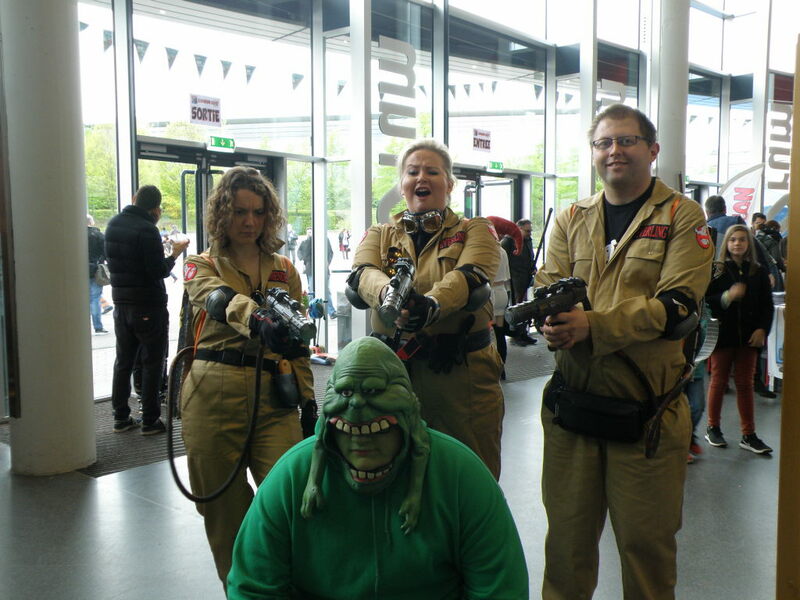 I have seen LARPers, Harry Potter fans, cosplay associations from France, Star Wars fans (501st Legion if I am not mistaken), Lego fans, modelling fans and last but not least the big table of Ghostbusters fans. I was not aware that this movie had so active fans and I have learned that the franchise is way wider than just the two movies. All the fan tables in this area made the corridor alive and worth visiting (and as the building is circular, you could see them multiple times ;P). I find this really great that so many different groups were presented during Luxcon. There were quite a few things (apart from the Ghostbusters fans) that surprised me. Some surprises were positive and some… and some I won’t be judging as just because I didn’t think something cool doesn’t mean it was a bad solution. The first surprise was the lack of badges – instead, members received wristbands in certain colours. Fortunately, the organization team, volunteers and guests had small badges so I have my traditional „souvenir” from a con. I was deeply moved by how the volunteers were treated. As I was helping just for a short amount of time, I was expecting there will be no bonuses for me except for maybe a snack. Instead, all volunteers received t-shirts, vouchers for meals, possibility to grab a free drink at the convention bar and a free entry to the whole convention. To a certain extent it was similar to how it is solved in Poland but at home you usually need to spend much more time volunteering (I hope that the help I had to offer was worth what I received). The programme was a total surprise. First of all (as mentioned) I was shocked by the small number of programme rooms. There were just four standard programme areas. 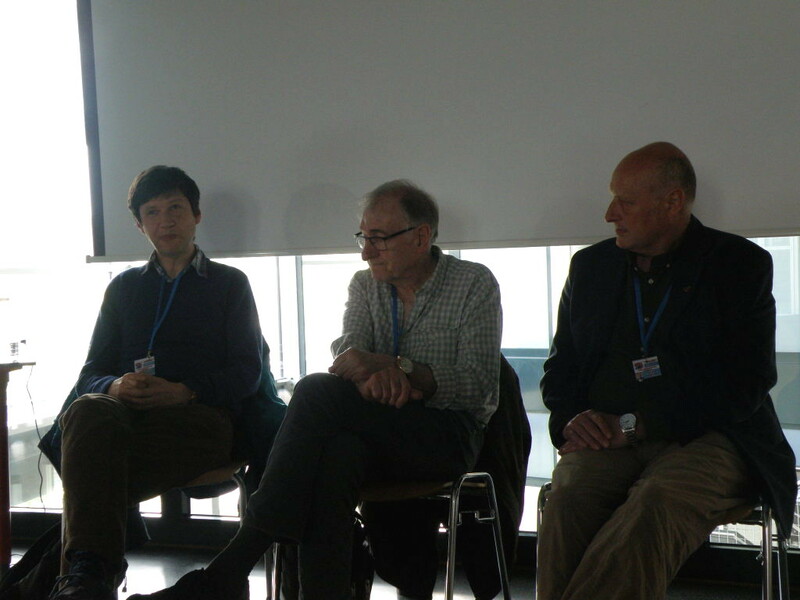 One was reserved for readings – which was a new type of programme event for me. I knew it existed, but I have never participated in it before. Unfortunately, most readings were held in languages I do not speak. The second room was filled mainly with demonstrations so we were left with two standard rooms for other programme items. What was even more surprising is that the rooms were not full (and sometimes they were almost empty). From the discussion during the feedback session I learned that there is no culture of attending panels and other programme items, so these few rooms were enough to accommodate all interested members. I was also told that the organizers are working on changing the approach so that more and more people would become interested in attending programme items. I think that inviting three interesting Guest of Honour was part of this work and Ian Macleod, Peadar O’Guilin, and Christopher Priest had a lot of interesting things to say and it was a pleasure to meet them. I must admit that I was taken with the ability of local fans to switch between languages. It was not an issue for them to switch from speaking English to German, then to French, Luxembourgish, and back again. It was impressive and this flexibility is for sure one of the reasons that allows fans and dealers from abroad to participate in Luxcon. Fandom is helping people in need in multiple ways so maybe I should not have been surprised by the charity campaigns undertaken by the Luxcon team but yet I was. There were a few ways of collecting money. Firstly, thanks to Errant Crafters, there was a raffle where you could win two pieces made by them (and I was lucky enough to win one of those :D). Secondly, there was a tombola with lots of stuff available for the lucky ones. I think that one food place was also helping a charity, but I did not check it. Finally, there was a charity auction at the end of the convention. 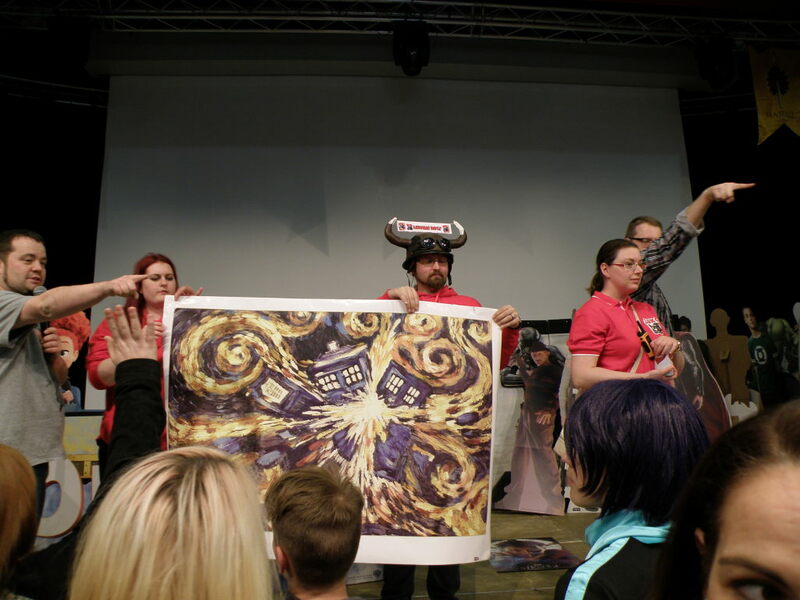 Luxcon was adorned with movie posters and stands and most of them were offered during the auction (together with some original artwork, an inflatable Dalek, t-shirts etc.). People were quite willing to buy a large part of the offered stuff. For example, a cardboard Thor stand went for 60 Euro and a picture with the autograph of one of the Star Wars actress was sold for 170 Euro. The atmosphere during the auction was friendly and full of joy. Not only members but also Luxcon organization team were participating in the auction. I don’t know what was the total amount collected from all charity events, but I am glad that we (as fandom) are supporting worthy causes. 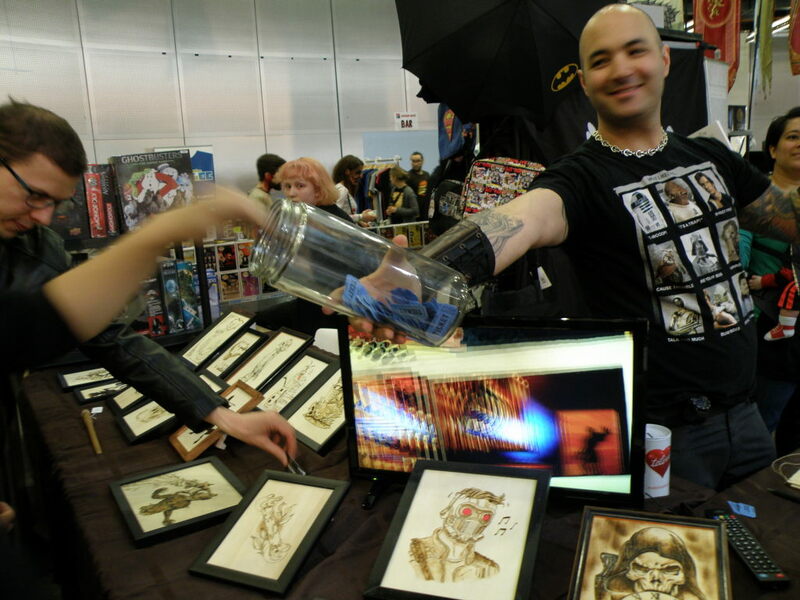 My impression is that Luxcon is doing a great job at making SF and geeky things in general as popular as possible. Year by year attendance is increasing. Looking at the many organisations who had a chance to present what they are doing, I am sure people who are coming get a good impression of the fandom. 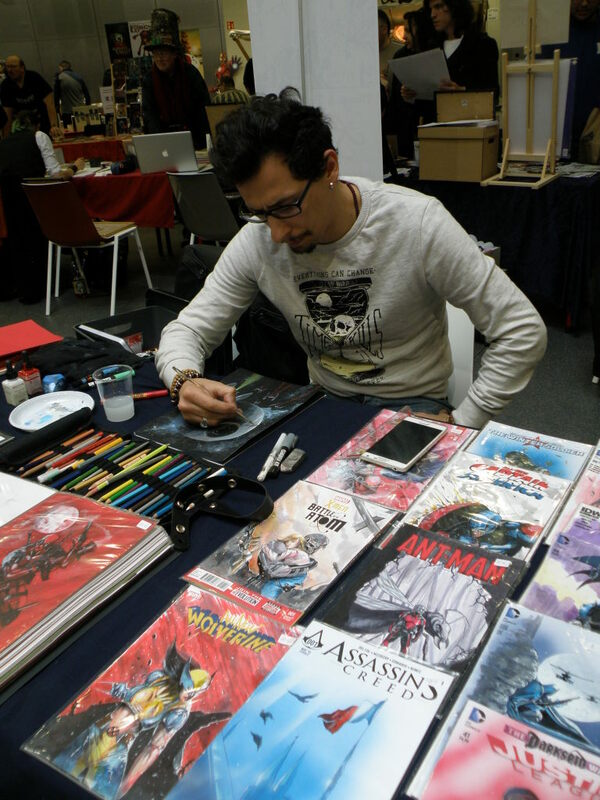 I don’t know how much time people were spending at the convention, but I am sure I saw fans of multiple things – literature, movies, TV series, Manga & anime, furry, postapocalypse, cosplay, modelling, lego and many, many more. Considering that the population of Luxembourg is below 600 000 people (and even if you were to add all the foreigners living and working in the city, it will be well below 1 million) gathering of 5000 people at an event is really a great achievement. I do hope that Luxcon will be continued and that each year it will be presenting all the geeky and nerdy stuff to as many people as possible. I hope that the joyous atmosphere will still be there and people will enjoy their time. Personally I would prefer to have more programme but it seems that the current need in the fan community of Luxembourg is a little bit different than mine and I think it is cool that organizers are keeping this in mind. I started my trips because I wanted to understand the fandom in other countries and Luxcon gave me some insight into a fandom that has different priorities and I am happy that I was able to learn it. For sure I will look at all interesting solutions I spotted and I will try to introduce some of them in Poland – we will see if this is successful. So I am keeping my fingers crossed for the team to make Luxcon 2018 a success! 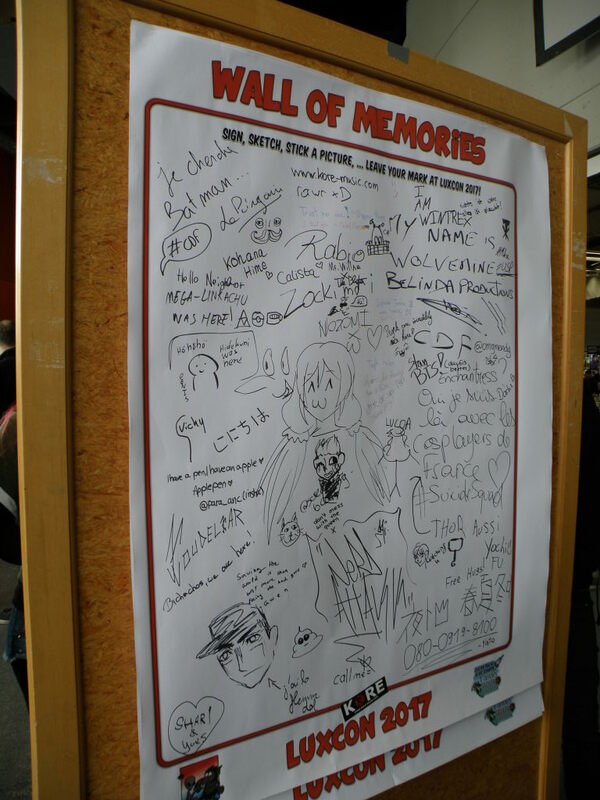 The next post will treat about biggest Polish convention (Pyrkon) and will be published on 5th of May.